Sniffs the ground and scratches itself. Occasionally digs at the ground, and howls. Very rarely dances. After defeating the rare elite Ceraxas at the Temple of Sha'naar in Tanaan Jungle, a small pup will appear. Interacting with this NPC will complete the quest to collect a Fel Pup, and the pet will be automatically added to your Pet Journal. 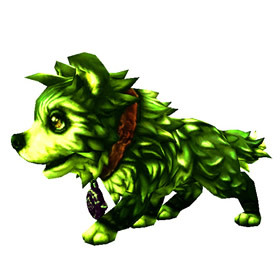 Fel Pup is a great humanoid counter: the beast racial gives resistance, Diseased Bite is an undead attack, Crouch reduces the damage by half during three turns and Howl also has sinnergy with the bonus from the beast racial if the pet has less than 50% health and can also be used in conjunction with an external Curse of Doom or another heavy hitting delayed attack. Also, i don't consider any of its stats lacking, but it's speed is specially good. Tradissa, did you get it? But why are you limited to one? Especially when you have other toons doing the quest. Like a Lost Netherpup, this beast has an undead ability (Diseased Bite in this case). Both also provide Howl. This finally allows to fight the humanoids faster with having an advantage of taking lesser damage. Just remember that its health in general isn't too high! Occasionally stands on its hindlegs and does a little dance. The cutest little demonic entity ever! Same as the others, I got it from the quest after killing the rare. I like Vengeance. Not much health but the speed is decent. I got this today. Remember this pet is unique. You can only have one of them. The little pup spawned immediately after killing the rare spawn it is linked to. It is located in the back center of the "room". Someone else got the pet before me, then I got it. So more than one person can pick it up per kill. Saw someone name their Barkimonde. It was awesome. Huh, so that's where this little guy came from. I was a bit overwhelmed running around in there solo, mainly just trying to keep my head stuck to my neck so I didn't notice getting him. Cute lil pup though, let's see how he can scrap. I got mine today after seeing someone running around with and i had to ask about it, it was easlier then i thought it was going to be to get. :) very happy to have this little cutie. Appears at 31,67 Temple of Sha'Nar in Tanaan Shortly after the death of the rare ceraxas, a large fel wolf. Killed momma Ceraxas previous day, but did not stick around since I was farming with a group. Did not know a quest giver spawned to get this pet. Will return, hopefully the quest giver is permanently there until you get pet. These pups are bundles of fur and teeth until they grow up, at which point they are really just teeth.